The NHS Diabetic Eye Screening Programme helps prevent sight loss in people with diabetes. Screening can detect diabetic retinopathy early, when treatment is effective at reducing or preventing damage from the condition. 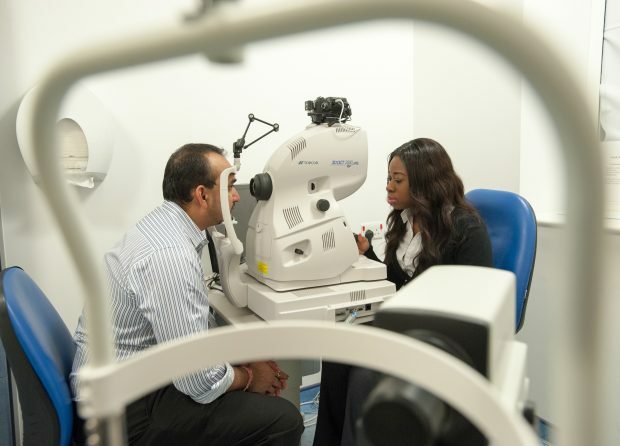 A total of 67 local services currently provide diabetic eye screening (DES) in England. In recent months I've been working hard with the national grading lead, Shelley Widdowson, to develop or update guidance documents to support these local providers. The administrative function is an essential element of local DES services. Following the introduction of the level 3 Diploma for Health Screeners qualification, administrative staff no longer need a bespoke qualification in DES administration. This will be reflected in the national service specification and pathway standards. We have developed new national guidance to help local DES providers develop a framework for the training and education of administrative staff. The guidance includes a list of competencies, assessment criteria, suggested content and links to appropriate documents. We are working to improve the clarity of grading definitions, and to improve agreement between graders for referable grades. The multiple blot haemorrhages (MBH) R2 feature has the most disagreement nationally in the test and training (TAT) system, and is one of the most difficult to classify. We've updated slit lamp biomicroscopy (SLB) examiner training and accreditation framework to incorporate the Level 3 Diploma for Health Screeners qualification within the pathway. The pathway to become an SLB examiner has been made clearer and the roles and responsibilities of SLB examiners and clinical leads have been clarified. Please contact the PHE Screeninghelpdesk if you have any queries, PHE.screeninghelpdesk@nhs.net.